This entry was posted in my life, photos and tagged photos, skywatch friday by Lilli Day aka bookbabie. Bookmark the permalink. maybe i should consider some wine myself to get a better shot next time! I picked the right day for my sunrise didn’t I? 🙂 love the Mr.’s shot! Very nice photo of sky – I really like it. I do like peppered clouds across the sky. 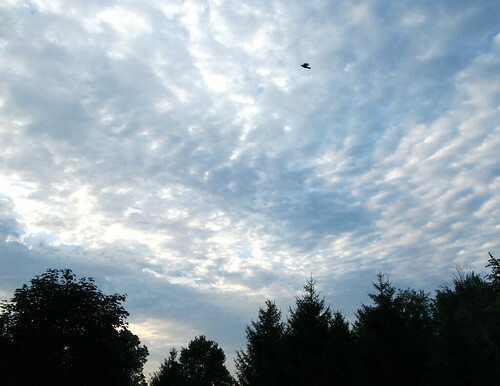 that speck of a bird against speckled clouds – great shot! The bird really stand out against that dramatic cloud march!! Neat photo!! Now that’s a big sky. Almost makes your head spin.